Welcome to Louisiana! This state makes your heart pound and your senses tingle. The celebration of Mardi Gras symbolizes the intensity of spirit of Louisiana. When the French brought Mardi Gras to Louisiana, it was a simple carnival event, celebrated just before the beginning of Lent. But New Orleans transformed the simple celebration into an extravagant festival, with parades, music, parties, street dances, and costumes. Although New Orleans is world-renowned for its Mardi Gras extravaganza, other towns and cities throughout the state host their own Mardi Gras celebrations. The excitement of the event is contagious all over. It's not just the Carnival that creates excitement. With her rich heritage of Creole, Cajun, and French, Louisiana life is spiced up with foods like gumbo, andouille, etouffees, sauce piquantes, cayenne pepper, Tabasco, and crawfish. And the senses tingle and feet keep tapping with the sounds of jazz and blues and zydeco. Louisiana is another state, along with Illinois, that bears the mark of Robert Cavelier Sieur de La Salle. The first European to descend the Mississippi River to the delta, this French explorer named the area La Louisianne after Louis XIV of France in 1682. This nickname refers to the people of Louisiana of French and Spanish descent and also to the culture they have preserved. This surprising nickname came about because of Louisiana's waterways and its trucking industry. People who live in or come from Louisiana are called Louisianians or Louisianans. Released to the Federal Reserve Bank by the U.S. Mint on May 20, 2002, the Louisiana State Quarter became the third state quarter released in 2002. Four major design elements mark the Louisiana State Quarter and create a moving reminder of the state's unique role in the formation of the United States of America. At the top of the quarter is the date Louisiana became a member of the United States; 1812. An image of a brown pelican, a trumpet with musical notes, and the outline of the Louisiana Purchase territory, with the inscription "Louisiana Purchase" round out the design. The Brown Pelican depicted in the lower left area of the quarter, is indigenous to Louisana and shows up in the state's nickname (The Pelican State) and on the state's flag. A trumpet and musical notes represent the intense musical heritage of Louisiana including the birth of jazz in New Orleans. The outline of the Louisiana Purchase, reminds us of the largest single expansion of the United States, which roughly doubled the size of the country, in 1803. The price was right too... about four cents an acre! Louisiana (From Sea to Shining Sea) , by Ellen Macaulay. 80 pages. Publisher: Publisher: Children's Press(CT) (March 2009) Reading level: Grades 3-5. Presents information about Louisiana's people, geography, history, landmarks, natural resources, government, state capitol, towns and cities, and more. 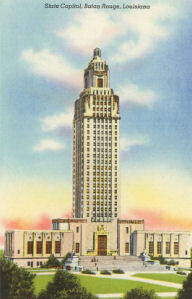 Louisiana (World Almanac Library of the States) , by Leslie S. Gildart. 48 pages. Gareth Stevens Publishing (October 2002) Reading level: Grades 4-6. Filled with the most up-to-date information, including the latest Census results. 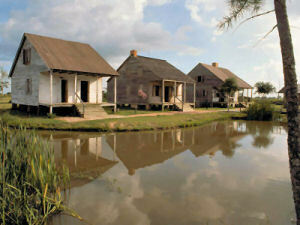 Full-color photos bring to life the story of Louisiana. In addition to an in-depth factual profile of Louisiana in the form of a state Almanac, this book offers fascinating and lively discussions of the state's history, people, geography, government, economy, culture, and lifestyles. A section on Notable People, a calendar of events, and enough primary source documents, time lines, maps, and other tools to make this unquestionably the best young adult reference material on the USA available anywhere. Louisiana Almanac: 2008-2009 Edition , edited by Milburn Calhoun. 760 pages. Publisher: Pelican Publishing; 18 edition (April 29, 2008) Whether you are new to the state or part of a family with centuries' of heritage, the Louisiana Almanac is an essential part of any home, school, or business. This updated edition includes important information like census statistics as well as interesting facts to know, such as the highest point in Louisiana (Mount Driskill). It includes charts of Louisiana's honorees for the Football Hall of Fame and vital history from the colonial days of the territory. From results of the LEAP test to the percentage of people with Cajun descent, this book is a must-have for everyone interested in learning more about the great Pelican State.. Roadside History of Louisiana , by Charles M. Robinson III. 336 pages. Publisher: Mountain Press Publishing Company; 1st edition (May 15, 2007) If variety is the spice of life, then Louisiana's history is a red-hot gumbo. Roadside History of Louisiana is a piquant adventure through Shreveport, Baton Rouge, and, of course, the Big Easy, as well as historic plantations, tiny bayou towns, and old railroad stops. You can almost smell the jambalaya as we tour the Cajun country, learning how the Acadians adapted to their new southern environment after Le Grand Derangement, the tragic expulsion of the Acadians from Nova Scotia in 1755. And you can almost feel the beat of the drums in New Orlean's Congo Square, where slaves once gathered to dance. With insight and warmth, Charles M. Robinson III follows the ups and downs of this great southern state, from the optimism of early settlers to the struggles of the Civil War, from the joy of Mardi Gras to the horror of Hurricane Katrina. Like the other books in this highly regarded series, Roadside History of Louisiana is divided into six regions, following highways and scenic byways through small towns and urban centers, enlightening both residents and visitors. Numerous historical photographs and maps enhance this guide to the history of the Pelican State. Louisiana: A History , by Bennett H. Wall, Light Townsend Cummins, Judith Kelleher Schafer, Edward F. Hass, and Michael L. Kurtz. 500 pages. Publisher: Harlan Davidson; 5th edition (January 2, 2008) From its ancient Indian peoples to its troubled beginning as a French colony to the tragic events of Hurricane Katrina, Louisiana has a history that, whatever else one might say about the state, has never been dull. This fifth edition of our classic survey history of Louisiana reflects a re-examination on the part of its esteemed team of authors of recent historical findings as well as of their own research, ensuring that Louisiana: A History will continue to present the most comprehensive and current account of the many different peoples that have and currently do make the rich, colorful land known as Louisiana their home. The History of Louisiana: From the Earliest Period , by François Xavier Martin. 556 pages. Publisher: Pelican Publishing Company; 3 edition (February 19, 1976) The scarcity of Louisiana's recorded past provides a great opportunity for the return of François Martin's intriguing work, The History of Louisiana . Originally published in 1827, this is one of the classic historical studies of the Pelican State by one of Louisiana's most thorough early historians. Martin befriended many leading figures of eighteenth- and nineteenth-century Louisiana, enabling him to write from a personal knowledge of people and events. Martin based much of his work on the writings of earlier authorities such as Garcilas de la Vegas, Pierre Charlevoix, and Daniel Coxe. His experiences as Supreme Court justice for 31 years, legislator, and historian armored him with the ability to tell history objectively while integrating his own critical judgement and interpretation. Finishing the account at the age of sixty five, his involvement in the government from 1803 to 1815 carry that section of the book vastly in depth. Martin takes readers on a journey through Louisiana's history from the adventures of Hernando de Soto to the pains of a state in recession. More than one hundred fifty years ago, this chronicler covered new ground in what many observers refer to as "the first history of Louisiana which merits the name."